For more than a decade, Judith Scott has been deeply involved in making large, colorful body-like sculptures out of found objects and yarn. Her works are abstract, dense, multilayered, and ultimately, a mystery. Judith cannot tell us what inspires her to create these objects. 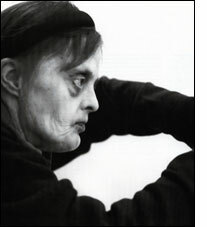 As a woman with Down syndrome, who is deaf and does not speak, these sculptures are Judith's most complex means of communication. Judith is an accidental artist. She spent 35 years institutionalized in her home state of Ohio with little or no creative outlet. It was only in the 1980's when her twin sister Joyce regained custody of Judith and moved her to the San Francisco Bay Area that her creative life began to blossom. Judith's work is now in some of the most prestigious art collections in the world and has captivated the interest of collectors worldwide. Though she is not fully aware of it herself, Judith is famous. Outsider: The Life and Art of Judith Scott is a documentary that transports viewers into a realm that is little seen and even less understood -- the creative and personal life of an "Outsider" artist. The film ventures from to the studio where Judith creates every day and the group home where she lives in Berkeley to museums and art galleries around the world where Judith's sculptures are exhibited and where her work is increasingly in demand. We revisit Judith's birthplace in Cincinnati and the institutions where Judith spent most of her life. Outsider: The Life and Art of Judith Scott delves deeply into the life of a compelling, eccentric and talented individual who has survived in the face of daunting odds.